Years ago, I used to get paid to play ping pong. It’s (almost) true! I was working at an office inside Incubate Miami for OceanGate and there happened to be a ping pong table less than twenty feet from where I usually sat. Almost daily, my boss and social entreperneur, Guillermo would come over to my desk and challenge me to a game. I didn’t realize it at the time, but he was sneakily conducting strategy meetings during our frequent matches. I didn’t realize it at the time, but he was sneakily conducting strategy meetings during our frequent matches. We’d start-out just like any other ping pong game: Zero serving zero. But then, somewhere on the way to my inevitable loss (he was VERY good at ping pong), we’d start discussing the nuances of the strategy we were implementing. It wasn’t particularly structured, but it was purposeful. The conversation took the same form and tempo as the game. We’d lob an idea over the net, and then bounce it right back. When a point was scored we’d pause, tally the score, and then move on to the next point. If we finished a game, but not the discussion, we’d just start another game. Sometimes we’d play for 10 minutes, sometimes for hours. Looking back, it seems that my most productive, A-ha!, moments were at that ping pong table. With that experience in mind, I committed to running PPCH events as way to further Alpha Current’s mission; “To help entrepreneurs become more successful and have more fun with their business.” And, since there’s no charge to attend, it can help any/all entrepreneur regardless of their funding situation. To help entrepreneurs become more successful and have more fun with their business. Stress-free Networking: PPCH is very casual and the atmosphere is very positive. But, you can still find a potential client, meet your next employee, or a qualify a new vendor. Support in Numbers: PPCH attracts a room of full of your peers that face the same sorts of issues that you face. These are your kind of people. Strategic Fun: PPCH is a great escape from your day-to-day. It forces you to work ON your business but it doesn’t feel like work. Those same benefits even apply to me when I’m organizing and holding the event, so it’s pretty awesome. I’ve been able to meet tons of new, cool people every week. Sadly, my ping pong skills have not improved much. ? 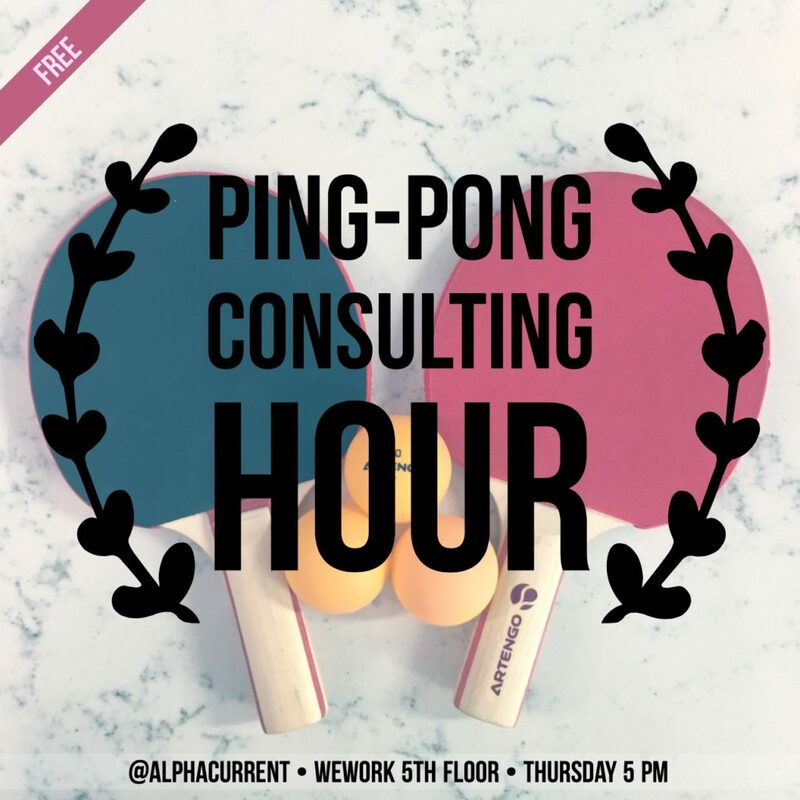 If you’d like to attend the next Ping Pong Consulting Hour, follow us on Instagram, Twitter and Facebook. We’ll post reminders and event details each week. We hope to see you! Alpha Current is a Miami based consulting firm. You have ideas. We'll create a strategy to successfully implement them.